Should we welcome some Old "Banned" members? Discussion in 'DRC Site Feedback' started by me_rubin, Oct 14, 2008. I wonder if we should send a shout out to those "Banned" members of SBS. I always liked realwx. I know others had problems with him at SBS but I liked the kid. SISO do you have his email address? I'm all for it,fresh starts are a good thing! SISO's already here and quite active. Yes, they are welcome here. DRC is the start of new beginnings. I agree...this is a fresh start for ALL of us! I say reach out to them. After I read about the discussion to try to get Chad on board, it hit me about 2 hours later: We should extend a Olive Branch to RealWx. I never had a problem with him either, seemed like a bright kid, and was always respectful as far as I could tell. I always liked Chad. You guys ever read any Vonnegut? He was our Canary in a Coalmine... I can understand why Chad ticked a lot of people off too, and, of course, I HAVE NO IDEA why he was banned, but, personally, I never saw him do anything in a thread that was a violation of the forum rules. It appears one of those who was banned at SBS has just joined us... craigiecubsfan. I can't remember what Chad was banned on SBS for, but I never really had a problem with him. I found an old gmail address for realwx and just sent him an email. Anyone have Chad's address? Hopefully you'll help us with some good Ol Hacking these radios again! I am pretty sure Semi has it.. Welcome Back, its good to see you here. Its a new chapter, enjoy yourself. MM sent me one and I just sent him a note too! Which reminds me...what happened with SBS again? Seems like I've missed a lot. Take a look at the SBS Tribute thread. That might get you up to date. 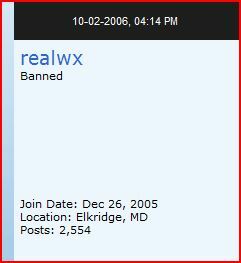 I'd point out some threads over at SBS but you are banned there..
Realwx did nothing wrong (well, ok, but not BAD)...Chad however...well, we'll see how long it lasts lol But yep, got to give everyone a fresh start I suppose. Yo SISO, Long time no see--er--talk! I've made a lot of mistakes over at SBS, but I'm willing to put it all behind me and start fresh. Like I said I might not be as active (I've got several web projects that still need working on, even a few that was supposed to be completed a year ago!) but I'll try and help out in the community whenever possible. This is a new place with new beginnings.